IP surveillance is rapidly growing. In fact, sales are expected to increase by more than 200% and over the next 3 years, more than half of the surveillance cameras used will be Internet-based. 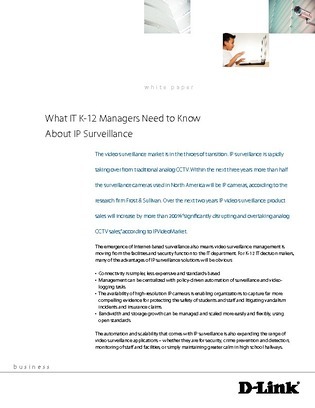 In this white paper, learn how the automation and scalability that comes with IP surveillance is expanding its range of video surveillance applications especially for IT K-12 decision makers. Then, uncover the top considerations when building the best IP surveillance solution for your organization.